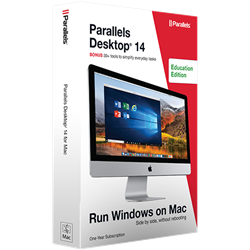 Parallels Desktop14 for Mac is the fastest, easiest, and most powerful solution for running Windows applications on a Mac - without rebooting. Easily switch between Mac and Windows apps. Powerful performance lets you run Windows productivity applications, like Microsoft Office, and the most demanding graphical apps, without compromise. Run a variety of operating systems, including Windows 10, on your Mac. Launch Windows apps from the Mac Dock, and Mac gestures in your Windows apps. Parallels Desktop-the #1 choice of Mac users.